We all like easy dinners right? Well this is incredibly easy, and is one of our favorites. I don't remember where I got the original recipe for this, I have it memorized now and can't find the original anywhere! But I just have to share it with y'all. I have never met a club sandwich I didn't like, I'll admit it. But this just takes it to a whole new level. Not only does this smell AMAZING, but it just tastes so good. I've made this a few times for friends and family too when I need a quick dinner or lunch for unexpected guests, and it is great for that because it's fancier than just a sandwich, but it's still simple and comes together quickly. I can't say as my little sous chef is a huge fan, because this sandwich is bigger than his mouth (haha, if you knew him you'd see just how funny that is since he NEVER stops talking! ), but he does enjoy the individual aspects of this meal, so I would say it's totally kid friendly, just more so for slightly older kids than my little sous chef. In fact this meal is so easy you could have your little ones (with supervision) help you make this, they can layer the meats and help assemble. It's always fun to get to play with your food, even as an adult it's fun to play with my food sometimes! Ha! Enjoy this incredibly easy meal, and have fun playing with your food! Cook Turkey Bacon according to package directions, and set aside. Slice the rolls in half, and lightly butter both sides. Sprinkle evenly with Garlic and Oregano. On the bottom half, layer 3 slices of Turkey, Chicken and Ham, then place 2 slices of bacon on top of that. Cut each slice of provolone in half, and place lengthwise on top of the meats. Place both halves of the bread on a baking sheet and stick under the broiler for 2-3 minutes (keep a close watch on them as they will burn quickly), until golden and the meats are warmed through, and the cheese is melted. Remove from the broiler and spread a little mayo on the top slice of bread, and finish off with tomato and lettuce, Serve warm. 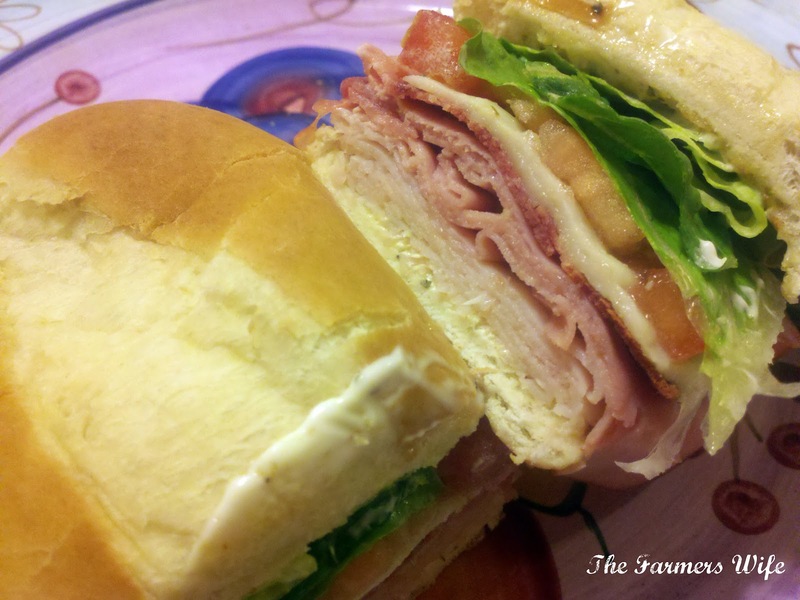 The addition of Garlic and Oregano just takes this sandwich to a whole new level. We just adore this meal with a fresh fruit salad, it's a great spring/summer time meal too. I know it may not be the fanciest meal in the whole wide world, but it's easy, versatile as you can use whatever meats you like and top however you want with veggies. This would be great with some sliced red onion too. 4.5 Stars. P.S. I've been nominated on Babbles Top 100 Food Mom Blogs 2011!! I'd greatly appreciate it if you'd vote for me, The Farmers Wife, it's easiest to find if you search alphabetically! Food doesn't need to be fancy to be good! This sandwich looks & sounds great! I voted for you! Good luck! This looks simple to prepare and perfect for my tastebuds. I am sure all those meats combined taste extraordinary! I love me some club sandwiches!! That photo is making my mouth water... I think I know what I want for lunch! Oh I love this sandwich..you did awesome job! That's one gorgeous sandwich! The garlic and oregano is genius, great job! this club looks and sounds delicious.